Net Assets is a family of publications focused exclusively on business and operational issues facing K-12 independent schools. Produced by the National Business Officers Association, Net Assets includes NetAssets.org, an online destination; Net Assets magazine, a bimonthly print publication (available to NBOA members only); and Net Assets NOW, a twice-monthly e-newsletter. Net Assets supports NBOA's mission of advancing business excellence in independent schools in the United States and abroad. Readers include chief financial officers/business officers, heads of school, and directors of human resources, risk management, information technology and facilities, among other functions. 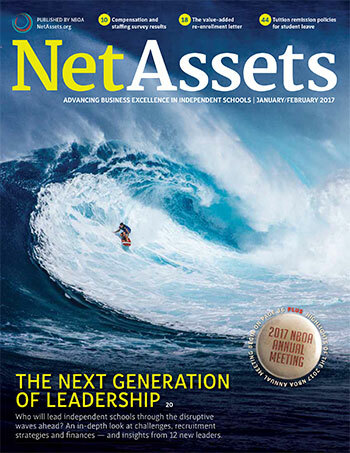 Launched in January 2017, NetAssets.org is a mobile-friendly website featuring best practice articles, interviews with industry thought leaders and news briefings related to independent schools. Some content is open to the public; premium content is available only to NBOA members. Learn more about NBOA membership or contact the Net Assets staff with questions. 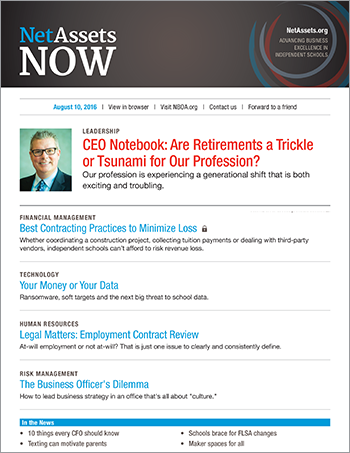 Net Assets NOW, a twice-monthly e-newsletter (formerly Bottomline), delivers mobile-friendly articles, news updates, leadership insights and links to NBOA news and community discussions. Anyone can subscribe, though premium content is available only to NBOA members. Net Assets magazine features columns on leadership, risk and compliance, practical strategies and business intelligence as well as thought-provoking articles on emerging trends and issues. Award-winning and highly rated by readers, it is published six times a year. This benefit is available only to NBOA members.